Michel Therrien liked what he saw from the Montreal Canadiens' power play. He is still going to keep tinkering with it. Looking to jump start Montreal's stalled power play, Therrien shuffled some players around and that was the difference as the Canadiens beat the Philadelphia Flyers 3-1 on Monday night to extend their winning streak to four games. First-place Montreal (5-0-1) remains the only NHL team unbeaten in regulation time. The main change was putting forward Alexander Radulov on the point with Shea Weber on Montreal's first power play. That strategy paid dividends in the third period when Brendan Gallagher tipped Radulov's shot from the point past Steve Mason at 13:08 to break a 1-1 tie. "We still need to work on it, we need a little more chemistry," Therrien said. "It would have been too easy to go back to the old formula, but we wanted to stick with our four forwards and one defenseman, and they're the ones who won it for us tonight." Therrien felt a change was necessary as the Canadiens came into the game 3 for 21 with the man advantage, 20th in the NHL. The experiment looked to have backfired though as Montreal went 0 for 3 with the man advantage to start the game. But Gallagher needed just four seconds into the team's fourth opportunity of the night to deflect Radulov's shot into the net. "They won the faceoff there and Weber's set up for a one-timer, so there's that option," said Mason, describing Montreal's game-winner. "But he gives it right back to Radulov. And he shoots it, and I got a good line on it, but Gallagher got his stick on there and changed the direction in front of me." Radulov finished with an empty-net goal, two assists, five hits, and he drew a penalty in the second period. "It was different because I haven't played a lot in that spot," Radulov said of his position at the point. "But with a partner like Shea Weber it's easy. I always try to look to my right to give him the puck because he has a bomb and we have to use that more." Radulov got an assist on Montreal's first goal. 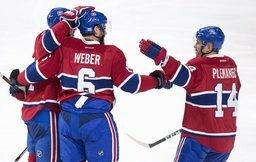 Weber put Montreal on the board at 5:28 of the second period with his second goal of the season. After good work behind the net by Radulov to get the puck back to the point, Weber fired a slap shot that broke Brayden Schenn's stick and deflected into the net. "The game was fast and I wanted to be ready," said Radulov, who has five points this season. "I don't want to take any shift off. The guys here know what it takes to win." Carey Price made 31 saves in his third consecutive win to start the season. "I wish he had the flu again tonight but it's not the case," Claude Giroux of the Flyers said of Price. "He's one of the best. We did a lot of good things tonight. They were able to get that power-play goal in the third to get the lead, but as a team we played a really good road game." After Weber's goal, the Flyers (2-3-1) tied it in the second period when Jakub Voracek deflected Giroux's shot past Price at 11:47. The goal came just seconds after Price denied Voracek all alone in front of goal. Voracek has three goals in six games this season. Notes: Mason stopped 30 of 32 shots in defeat. . Price played his 450th game with the Canadiens. . This was the first of three meetings between the teams this season. They meet again Nov. 5 in Montreal. Flyers: play the second of a back-to-back at home against Buffalo on Tuesday. Canadiens: are at the New York Islanders on Wednesday.